Sony's great white hope is on board for another adventure of percolating cuteness and what a surprise, so are we. Toro’s back with a vengenance, helping people realize their dreams and collecting pieces of a fallen shooting star. 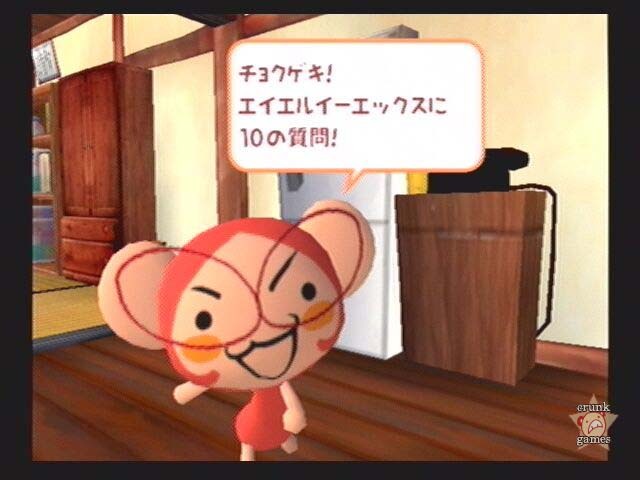 It’s kind of funny that in 5 years, the Doko Demo Issyo series has kept its popularity simply by sticking close to its gimmicky, fill-in-the-word virtual pet gameplay. But it’s a nice surprise that Sony is celebrating the anniversary by releasing Toro to Nagareboshi, a game that treats the series’ trademark as more of a supporting player. It’s no longer about just making your pal happy, no, now you have a plot to contend with and other people to keep track of. It’s the first real Doko Demo adventure, and maybe it won’t be the last. 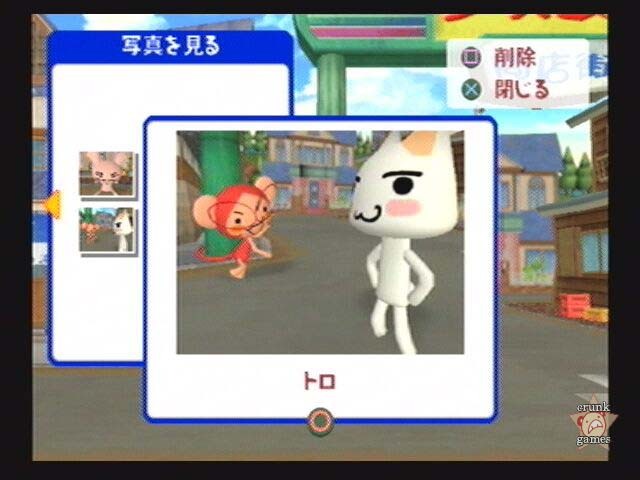 Although Toro’s on the box, the game actually opens with you the player: you name your character, fill in the necessary personal data, choose from a generic boy or girl avatar and you’re on your way. The setup is like an urban Animal Crossing: you’ve just arrived in quaint Yumesa Town and are moving into your new apartment complex. Upon entering your new digs, a loud flushing sound eminates from the bathroom. You dare peek inside and inside, sitting on the can is none other than your new roomie Toro. You introduce one another and quickly get to work putting away your things. As night comes and the two of you are mostly settled in, Toro suggests going out to the window to enjoy the evening sky. He recalls the timeless practice of wishing upon a shooting star, and wouldn’t you know it, one appears soon after. You both chant your wishes and hope for the best when suddenly the room fills with light and the star crashes to the earth. Shaken but not stirred, you set out to investigate and discover that the star smashed against the communication tower at the top of the hill. After questioning the locals it becomes apparent that you and Toro aren’t the only ones affected by this event: nearly everyone in town had some sort of little dream go unfulfilled thanks to the star’s grand entrance, and coincidentally the two of you become wrapped up in every one. Your resultant quest is to help everyone realize their dreams (advertently or not) and recover pieces of the shattered star, eventually restoring peace and satisfaction to the town. The story is told in a series of chapters, all containing varying degrees of humor and drama. Mind you, the cuteness remains cranked at 100%. 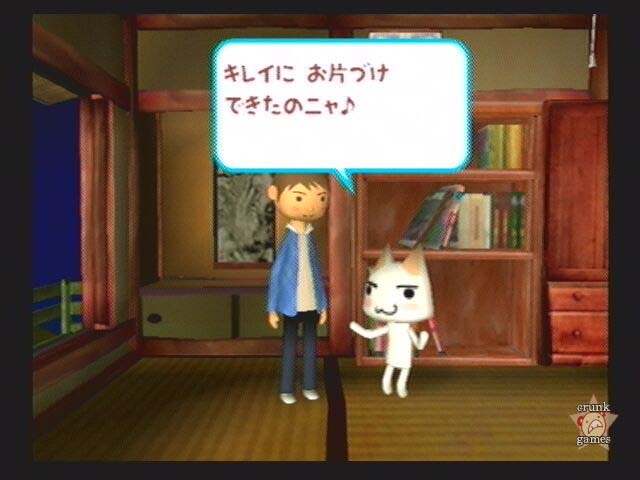 As mentioned, Toro to Nagareboshi takes after the other games in the series by utilizing a word input interface. There are numerous instances when you’ll be prompted by Toro or someone else to answer a question, describe a person, name something you like or whatever else, and you’ll be forced to enter your response in the onscreen keyboard. Whatever you put in will be referenced at various points from then on. There are no right or wrong answers since the story moves along just fine no matter what you say — you’re allowed to use random symbols and the English alphabet, proving that the game doesn’t really care as long as you keep on with the main quest. It slightly cheapens the overall gameplay, but it’s a necessary evil the series is known for, so expecting Sony to just toss it out would be silly. The rest of your time is spent playing a rather standard adventure game, full of walking, talking and using items. There’s not much more to it than that but hey, if it ain’t broke, don’t fix it. 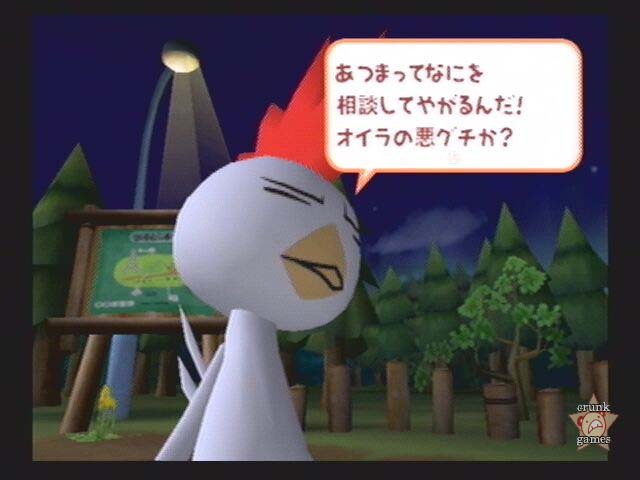 Besides, like any good adventure, Nagareboshi is dependent on character, and with an already healthy stable of Pokepi (the term used for the animal cast) it does just fine in that regard. To keep the marketable madness fresh, there’s a new group of critters such as the punk chicken Andrew, ne’er-do-well bulldog Caesar and the oddly familiar but insanely adorable monkey reporter Kikko. They’re all suitably expressive with their kooky facial expressions and animations, but the humans are just as much; your fellow apartment tenants alone get a whole chapter concerning them. It’s an odd place where animals and people coexist, but both are so similar it hardly makes a difference. Everyone has their distinct quirks and issues, and they all play off each other well. 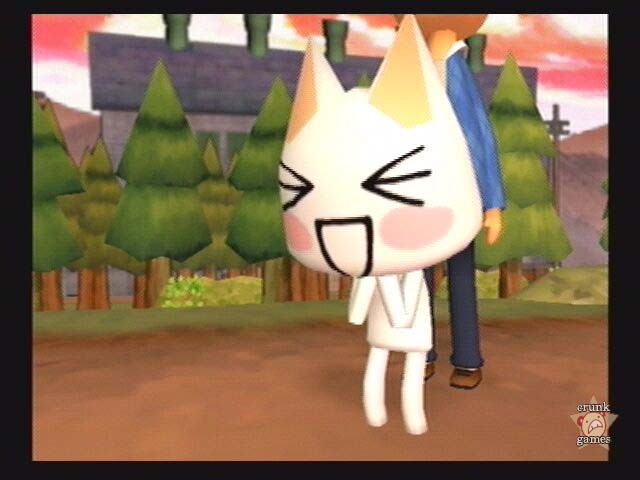 The character dynamics are helped along by the game’s visual style, which takes the traditional low-detail, soft-colored looks of the Pokepi and expands them to the rest of the game’s world. It’s vibrant and cartoony — not cel shaded exactly, but that actually makes it feel more alive, and there’s enough creative uses of lighting and camera angles to push that feeling. Nagareboshi also carries itself well in the audio department, but there is some tragedy to it. The good part comes in the overall sound, which, like the graphics, is appropriately cartoony, making your game room sound like there’s a French farce going on right next to you. There are dramatic pieces too that sound more like a Disney classic. Not to mention the inclusion of Ayano Tsuji’s rendition of When You Wish Upon A Star and her little ukelele ditties that introduce each chapter! However, the tragedy lies in the brevity of some music tracks, making for excrutiating looping after a while, especially when you find yourself stuck at some point in the game. And of course, there’s the requisite mini-games and extra things to play around with. The most fun is the camera, which lets you snap pics of anyone and anything while moving around in first-person (limited first-person, but still). If you’ve captured a certain character, you can take the photo back to the camera shop where the owner may display it outside. There’s other things like karaoke-ing with Jun, fortune telling with Pierre and getting gymnastic at the park, or checking Kikko’s Uki Uki Shinbun to catch up on the town’s latest happenings (or get a clue as to your next destination).